A new world record for Chinese art? 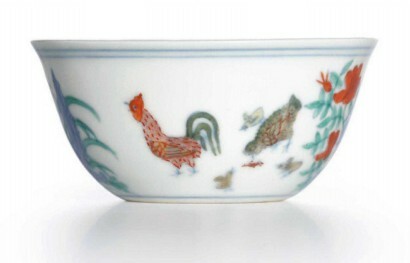 A 15th century “chicken cup” is once again poised to shatter the record for a Chinese work of art at auction, 15 years after it achieved the then record price of $4m in 1999. Following a string of increasingly high profile sales of Chinese art, a new figure of $32.4m was set for a Qing dynasty vase at Sotheby’s Hong Kong in 2010. It seems almost a certainty that the cup will break the current record, due to the extraordinary regard with which it is held in Chinese culture. At first glance, the diminutive cup does not look much like a contender to become the most valuable anything, but like many of the most fascinating collectibles – there is more than meets the eye. The story begins in the Chenghua period of the Ming dynasty (1464-1487), where the cups were produced in tiny quantites in the imperial kiln. They were designed specifically for the appreciation of the emperor and as a result, the quality of the porcelain and the simple, elegant painting is unmatched. Their delicate beauty fascinated subsequent generations, who saw in the cups an unmannered and unaffected aesthetic perfection. Subsequent emperors and scholars sang their praises, resulting in a meteoric rise in value throughout the Ming (1368-1644) and Qing (1644-1911) dynasties. They took on an almost legendary quality, becoming symbols of Chinese artisanship. Endless copies have been made throughout the ages to feed the public demand for these iconic wares and now, of the very few originals, only three survive. Posted in Antiques, Asian Art, Ceramics, Chinese Art, Collectibles, Collecting, Collector, Investment, Unique collectibles and tagged 15th century, Asia Week New York, Asian Art, auction, Ceramic, Chengua, Chicken, China, Chinese, Chinese art, Christie's, collectibles, collecting, Collector, Cup, Jingdezhen, Ming, Ming dynasty, Porcelain, Qing dynasty, Sotheby's. Bookmark the permalink. 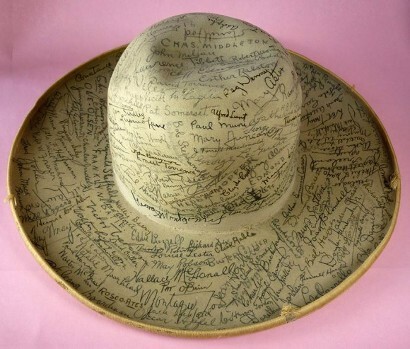 A hat mysteriously appears at auction, covered in the signatures of 400 of the top names of Hollywood’s Golden Age: Douglas Fairbanks, Charlie Chaplin, Clark Gable, the list goes on. The huge Stetson cowboy hat is a remarkable relic, but autographs just aren’t what those in attendance are looking for, and bids are slow to appear. One man, realising the hat’s potential value, puts his hand up and places the winning bid – it’ll make a good talking point, if nothing else. Yet when our bidder takes the hat home, he’s drawn by its power. Just how does one person get all of those autographs? Where did it come from? How much is it really worth? And so, research got underway. With limited experience in autograph collecting, Blitman was uncertain to say the least. However, after hours of pondering, he noticed one thing: all of those that signed the hat worked for either MGM or Fox, as opposed to other major studios Warner Brothers, Paramount or RKO. What do Fox and MGM have in common? Blitman was at a loss, noticing only one similarity: they’re both on the same side of Hollywood, with the other situated on the other side of town. Blitman began to dissect the hat (not literally, don’t panic collectors! ), grouping together the autographs that fill every inch of space. 90% were actors, with a couple of boxing champions thrown in for good measure. The history of the hat still eluded its new owner…but then Blitman struck gold. Four of the names on the hat were those of make-up men. Very few collectors would bother to trouble a make-up artist for their John Hancock, so all clues pointed to an insider…but who? A guard at the gates, a receptionist, a work experience kid. It could’ve been anyone. Digging deeper into those four names, Blitman became dismayed at the lack of information. Turns out, very little knowledge of the early make-up artists was passed on to future generations, and there was almost no trace of Jack Dawn, Ward Hamilton, Bob Stephanoff or Cecil Holland to be found. Just a few short biographies of each exist, yet one mentioned that Cecil Holland had a daughter, who Blitman discovered is still alive. A chance email is fired off, but Blitman isn’t hopeful and is on the verge of giving up. I was delighted to receive your email with a request for information about the cowboy hat. You have reached the right person for its background. It was my father, Cecil Holland, who got all those signatures from the actors who sat in his makeup chair… many of whom later became friends … It was his pride and joy. Margaret, Cecil Holland’s daughter had replied – and what a reply it was! Joe Blitman was now the owner of Cecil Holland’s pride and joy. But who was Cecil? Blitman lists him as an “accomplished actor, engraver, etcher, photographer, painter, jewelry maker, sculptor, wood-carver and most importantly, a dedicated and deeply talented make-up artist”. An Englishman born in 1887, Cecil Holland shared the same enterprising nature as Blitman, embarking on several varied careers before becoming a make-up artist at the dawn of the silent-era. He went on to provide the make-up of almost every star of the era, as well as acting alongside the likes of Rudolph Valentino. As each of the stars entered his make-up room, Holland would request their autograph, each dutifully adding their name to the historical hat. Obviously, Blitman isn’t keen to part with the hat now, but he is eager to tell the story of Cecil Holland, a remarkable star whose name should never have been forgotten. 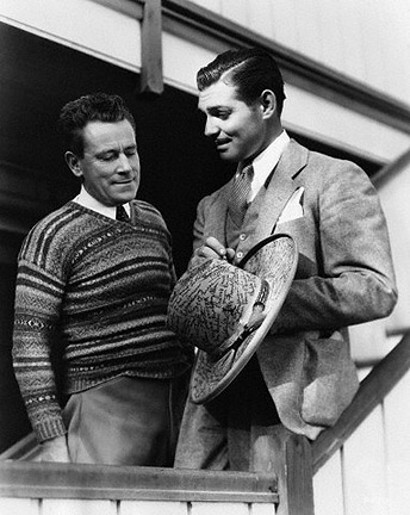 Learn more about Holland’s Hollywood Hat here. Posted in Autographs, Celebrity, Collectibles, Collecting, Collector, Film memorabilia, Memorabilia, Movie Memorabilia, Music memorabilia, Unique collectibles and tagged actor, artist, auction, autograph, cecil, Cecil Holland, Clark Gable, collectibles, collecting, Collector, Fox, Gable, golden age, hat, holland, hollywood, Hollywood Hat, Joe Biltman, Joe Blitman, make-u, MGM, movie memorabilia, signature. Bookmark the permalink. PS4? Xbox One? 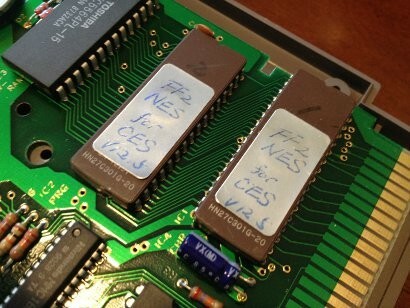 I’ll take the NES any day. It’s official. The Sony PS4 is winning the much-publicised sales war against Microsoft’s Xbox One, at least in the UK. The games console has sold over 2.1m copies since November 29, with Microsoft keeping rather quiet, stating only that there have been “over 3 billion zombies killed in ‘Dead Rising 3’”. But here at Paul Fraser Collectibles, we tend to shy away from technological advancements, preferring to bury our heads in the fascinating items from the past. As the world clamours to own one of these consoles, we’re only now looking at the earliest computers. It’s not that we’re completely behind the times, but rather that collectibles are our business, and early computers and technology are becoming just that – collectible. One of the best known computer games in the world, Tetris is nothing short of iconic for the generation that grew up playing it. Even if you’ve never had a go, you can probably hum the hypnotic theme song or describe the falling blocks. But did you know that, before being released by Nintendo, the game was actually developed by Russian company Tengen and was billed as “The Soviet Mind Game”? However, once released, Nintendo argued that it had the distribution rights to the game, and ordered all of the existing copies to be destroyed. Today, just three copies are known to exist, with one example appearing on eBay valued at $40,000. One of the first games to be released exclusively for the PS4 is Final Fantasy XV, much to the delight of the series’ dedicated fanbase, yet an English copy of the second game in the long running series will still cost you far more. The game was originally released in Japan on Nintendo NES in 1988, and plans were in motion for an English version of the game to be released in 1991. However, the game was scrapped due to Nintendo deciding to put its efforts into the English version of Final Fantasy IV, which had already been released on SNES by the time they got round to it. Since then, only one pre-production sample cartridge has surfaced, valued at $50,000. 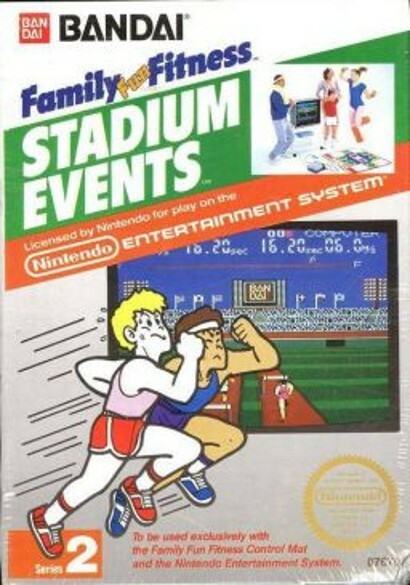 Stadium Events was released in 1988 for use with the Family Fun Fitness Mat, an early precursor to the dance mats of the late 90s. A run of the mill athletics game, it hardly sounds like the kind that collectors would pay thousands for today. However, due to Nintendo buying the rights to the Family Fun Fitness Mat and rebranding it the PowerPad, before destroying all copies of any game that could be used with it, Stadium Events is incredibly rare. Apparently, only 2,000 copies were produced (remember, video games weren’t quite as popular back then) and only around 200 were sold. 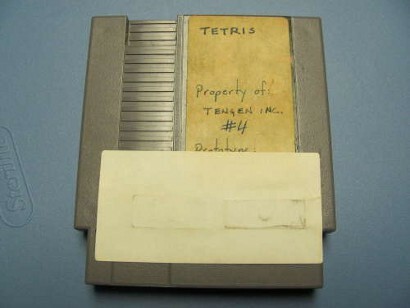 In 2010, a sealed copy of the game reportedly sold for $41,300 – the record for any video game sold at auction. Another example is said to have gone for as much as $800,200, though I – and many other sources – find that hard to believe. Looking at those collectibles, it’s obvious that Nintendo is the collector’s choice, yet the gaming giant seems to have dropped out of the current sales race: the PS4 and Xbox One have both outsold the Wii U’s lifetime total in the UK in just a few weeks (the Wii U was released more than a year ago). Posted in Auction, Collectibles, Collecting, Collector, Investment, Memorabilia, Unique collectibles, Video Games and tagged Bandai, Collectable, collectible, collecting, Collector, computer, game, games, Microsoft, Nintendo, Nintendo Entertainment System, Nintendo NES, Paul Fraser Collectibles, PS4, rare, Stadium Events, Tengen, Tetris, valuable, video game, video games, Wii, Wii U, Xbox. Bookmark the permalink. Not a WordPresser? Don't worry! Just pop your email address in the box and we'll send you all our latest blog posts! If you are interested in writing a guest post for our blog please email us with some info about yourself and what you would like to write a post about. Or we could write for you! If you would like us to write a guest post for your blog, just send us an email with all the information and we'll get back to you shortly.